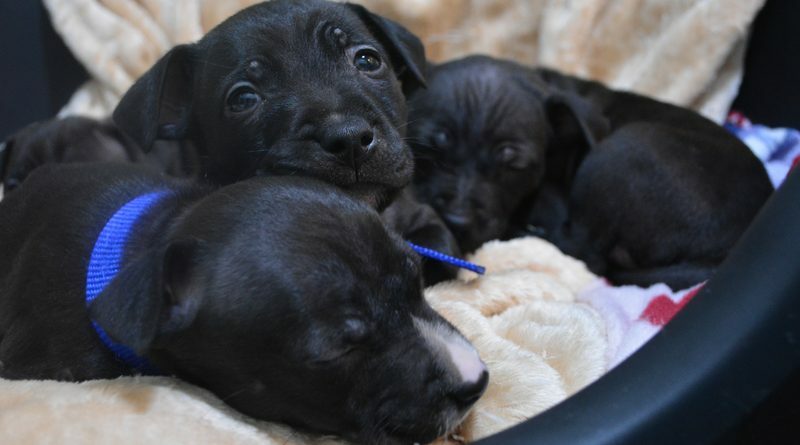 Trapped in a box and abandoned in the cold, four young puppies had a lucky escape when they were found by a good Samaritan, who rushed them into Battersea Dogs & Cats Home. 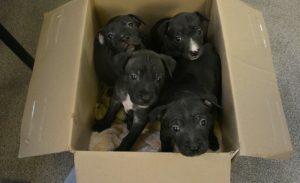 The kind passer-by was walking through Victoria Park on Tuesday 9 January when he heard the puppies crying and discovered them shut in a box on the sidewalk, shivering. He brought the seven week old Staffordshire Bull Terriers straight into Battersea, where vets were on hand within minutes to give them a thorough check over. Luckily, all the puppies were in good health, and staff decided to name them after famous suffragettes, to commemorate the hundred-year anniversary of the women’s vote. The three girls in the litter – Emmeline, Lydia and Edith – are named after Emmeline Pankhurst, Lydia Becker and Edith Garrud, while the only boy was christened Davison, after Emily Davison. 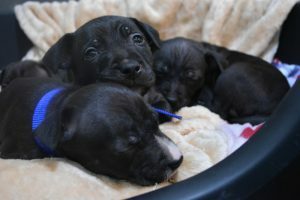 The four puppies all have homes lined up, but are being looked after by Battersea’s foster carers until they’re old enough to go to their new owners.